Bedrooms are no longer just a place to sleep; they are a retreat from the stresses of the world. They are a vacation villa without the airline and exotic costs of the adventure. With all that goes into decorating your getaway, many propose using eco-friendly sustainable materials in order to furnish. Using eco materials in beds that will promote a healthy environment and a low carbon footprint will not only highlight your flair for the green way of life, but also the serenity of your surroundings. Hemp is an all-natural sustainable resource that is environmentally friendly and non-toxic. This frame is a stunning handcrafted piece of carpentry that is upholstered with organic hemp fabric. The manufacturing of this frame includes natural latex, organic cotton, and hard wood. The frame is well made, strong sturdy construction that will serve your needs for many years. Fill your bedroom with this stunningly beautiful bed that will sustain your sleep as well as the environment for many years to come. The wood is treated with a natural non-toxic chocolate stain. 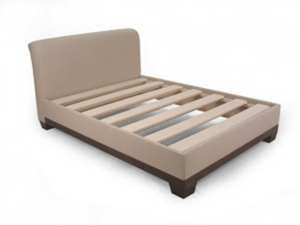 The frame comes with solid wood slates to use with a mattress or without to use with a box spring set. Finish this ensemble of with a natural mattress and bedding for the perfect eco-friendly design. Depending on size and design this frame will cost you between $2900 (£1866) and $4900 (£3153). 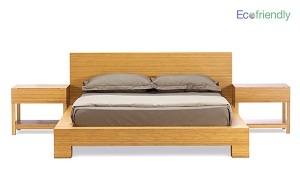 Made of a solid clear fir wood, the Padded-Slat Shasta Platform Bed Frame by Phil Peck is a beautiful eco-friendly designed furnishing for your bedroom that has been finished in natural Tung oil. The fir wood is a sustainable wood that supports the latex slatted frame. Talalay latex is used as an optional add on that will promote air circulation and provide more comfort than a standard platform bed. The delivery time for this handmade artisan bedframe is about three to four weeks but delivery, shipment, and setup are all free of charge. 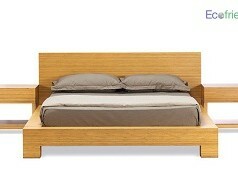 Ranging in price base on size and slat type this bed will cost you from $768 (£494) to $1775 (£1142). Bamboo is a flowering perennial evergreen in the grass family that is some of the fastest-growing plants in the world. This makes them sustainable, eco-friendly, affordable, and versatile building materials with a high strength-to-weight ratio useful for furniture and structures. 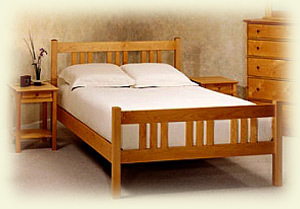 The Tentai Bamboo Bed is a graceful, natural, and will add to beauty of your home. This is certain to add to the strength of your retreat with it blending of design and warm colors. In Japan bamboo symbolizes integrity, bravery, and flexibility. Bringing this bedframe into your room will not only represent your dedication to eco-friendly materials but also to sustaining the earth as a whole through strength of character and flexibility of nature. This frame costs $1399 (£900) from the queen size and $1699 (£1093) from Pottery Barn. Rest and relax in this stunning harmonious set from Pottery Barn made of eco-friendly bamboo. The Nagoya Bamboo Platform Bed is more than just a bed; it is a retreat from your stresses to sink into at the end of long day. 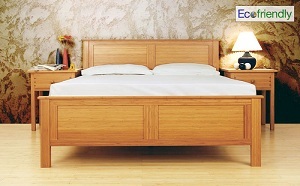 The frame comes in queen or king sized in solid wood with upward curved slats that works with any type of mattress. Simple assembly required upon delivery. The queen size will cost you $1199 (£771) and the king will be $1299 (£835). Platform beds have come a long way since the college days of wood planks and cinder blocks. The new modern designs offer a smart and sophisticated look to your bedroom retreat. The simplistic straight lines lend to the Asian design with the luxury of European motif. 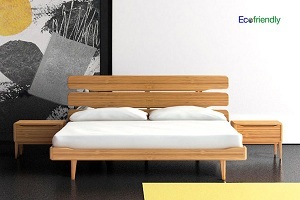 Eco-Friendly bamboo wood, creating unique bedroom furniture set that is of a beautiful look and feel but also one that is made in a manner in complete harmony with the environment. The set will cost around $2000 (£1287) for the beauty of sustainability in your home.